As in Egypt, protesters come out as backlash against Western-fomented color revolutions unfolds. No sooner did the long-announced protest start, then police acting under orders of the Yingluck Shinawatra "Peua Thai Party" (PTP) led government began firing tear gas at protesters challenging police lines. Image: As mentioned in a myriad of foreign media publications, Thaksin's proxy party ran with the slogan, "Thaksin thinks, Peua Thai does." 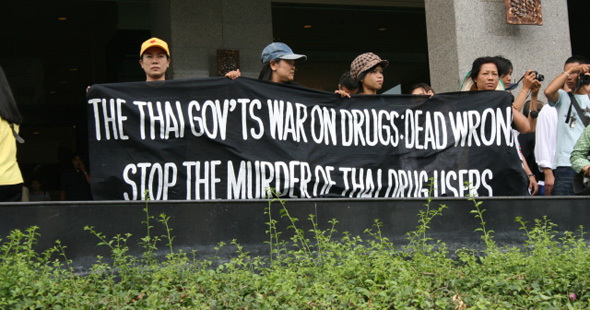 Thaksin is an accused mass-murderer, a convicted criminal, and currently resides in Dubai to evade 2 arrest warrants. Image: (@pissanuk - Twitter) Taken today, November 24, 2012, near the protest site. Clashes with over-zealous police acting on government orders have already taken place before the rally fully began, with the government declaring it has its notoriously violent "red shirt" mobs standing by to intervene if necessary. The catch is, of course, that several pro-government "red shirt" rallies had already taken place earlier in the year, allowed to paralyze the center of the city without any government restrictions or serious police presence. These same pro-government protesters had in 2009 and 2010 committed wide scale violence, killing by-standers, troops, police, even fellow protesters, while committing arson, vandalism, and city-wide looting. Many of their leaders who had openly called for violence, arson, and looting on stage, are now sitting MPs within the current Shinawatra regime. Now in contrast, anti-government protesters have faced preemptive moves by the US-backed ruling regime, to chill free speech, intimidate and restrict the number of protesters planning to attend the November 24th protests, and attempts by the police to restrict the protesters' movements to prevent the same sort of disruption their own pro-government protesters are regularly allowed to cause, or exceed. Why are Protesters in Thailand Angry with the Shinawatra Regime? The current Thai government is led by Yingluck Shinawatra in name only. 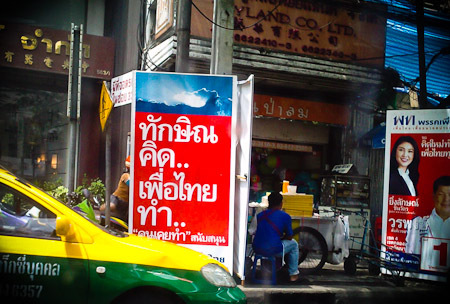 The 2011 PTP campaign slogan was literally, "Thaksin thinks, Peua Thai does," referring to Yingluck's brother, Thaksin Shinwatra, the deposed the NWO Empire Wall Street-backed billionaire ousted from power in 2006 after a collimation of mass-murder, treason, and corruption. Clearly, just as in Egypt, Thaksin Shinawatra, and his sister, installed as his nepotist proxy, do not truly represent the Thai people, nor the best interests of Thailand itself. Their support base is a minority - simply the loudest, better organized and funded political machine in Thailand, putting the current government into power with a mere 32% of eligible voters actually casting a vote for PTP. 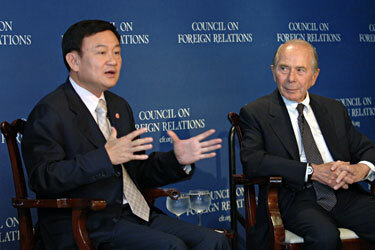 One need not be a "royalist" to understand the threat Thaksin and his proxy government pose to Thailand and its future. And while Egypt's current dictator, Mohammed Morsi is more difficult to defend, the West is preying on the ignorance of the general public to sell the current US-backed regime in Thailand as "democratically elected," "legitimate," and "justified" in their crackdown on anti-government protesters.